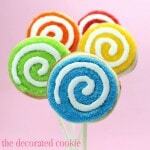 Today’s sneak peek of prop cookie pops inside Sugarlicious is hosted by one of my first go-to sweets blogs, CakeSpy! This creative genius somehow managed to create her own career that combines art, baking, writing, shop-ownin’ and Cuppies. 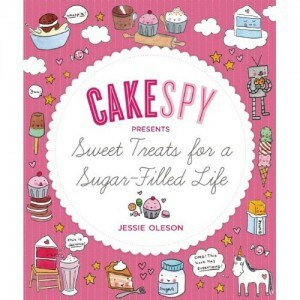 By the way, I hope you already own the cutest book ever, CakeSpy presents Sweet Treats for a Sugar-Filled Life, by Jessie Oleson (aka, CakeSpy). But if you don’t, you must buy it immediately. Yes, this is me calling another book the “cutest book ever” and I even have the word “cute” in my subtitle. And bonus, if you buy both of our books at amazon, you get free Super Saver shipping. Just sayin’ is all. Just to tempt you away from Sugarlicious for just a moment, why I heart CakeSpy’s book: Because you can eat Cadbury Creme Eggs Benedict for breakfast, or S’moreos for breakfast, I s’pose, if you want, or try Elvis Whoopie Pies if you’re into peanut butter and bacon, or deep fried cupcakes on a stick. And the illustrations make you happy while you bake. Think unicorns and rainbows happy. But I digress… It’s so easy to do lured by Cuppie. 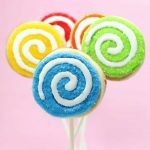 Straight from the book, find the how-tos to make prop cookie pops HERE at CakeSpy. Or see below! *Find cookie sticks, decorating bags, couplers and tips at the craft store. For food coloring, I suggest Americolor Soft Gel Pastes, found online or in specialty stores. 1. 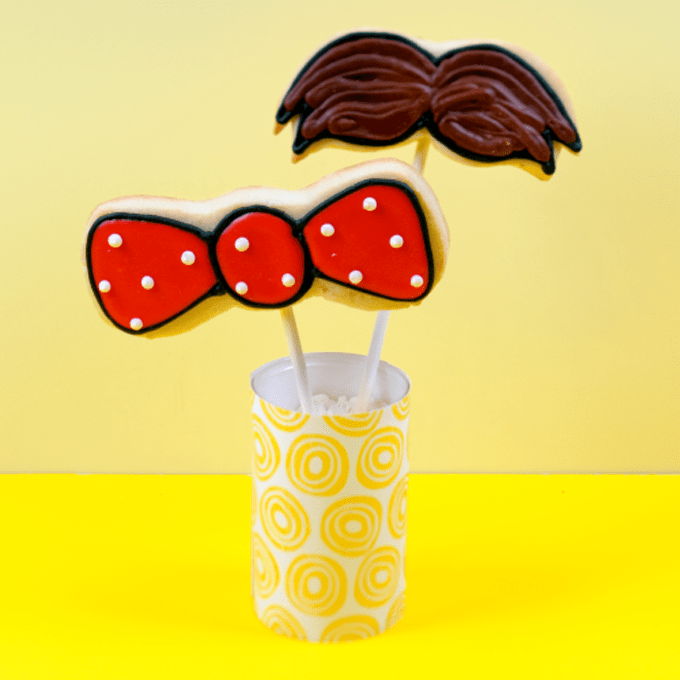 Roll out chilled cookie dough on a floured surface about 3/8-inch thick, cut out your mustaches, bow ties and eyeglasses with the templates, insert sticks and bake according to the recipe. Let cool completely. 2. Prepare royal icing according to the recipe, divide and tint. 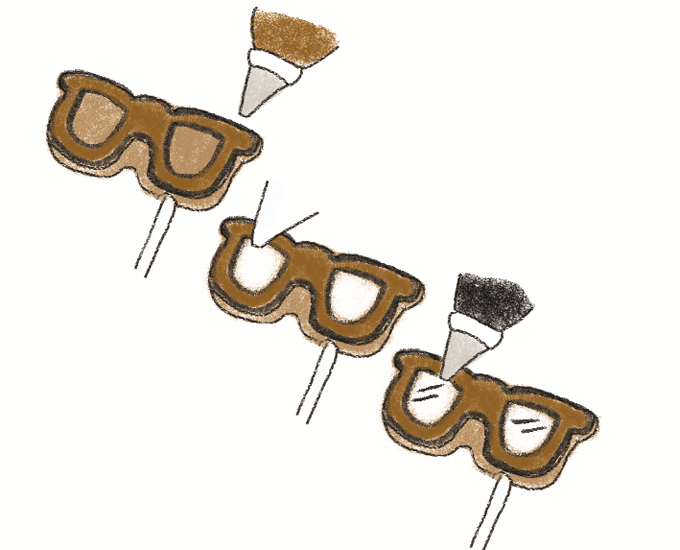 Use any preferred colors for the mustaches (such as brown or gray), bow ties and eyeglass frames. You’ll also need black and white. I used black, white, brown, bright blue and red. Prepare 3 decorating bags with couplers and 3 different size tips. Fill the bag with the size 3 tip with the black icing, the bag with the size 5 tip with the brown icing, and the bag with the size 2 tip with half of the white icing. Cover and reserve the rest of the white icing and the blue and red icing. Close the bags tightly with rubber bands. 3. 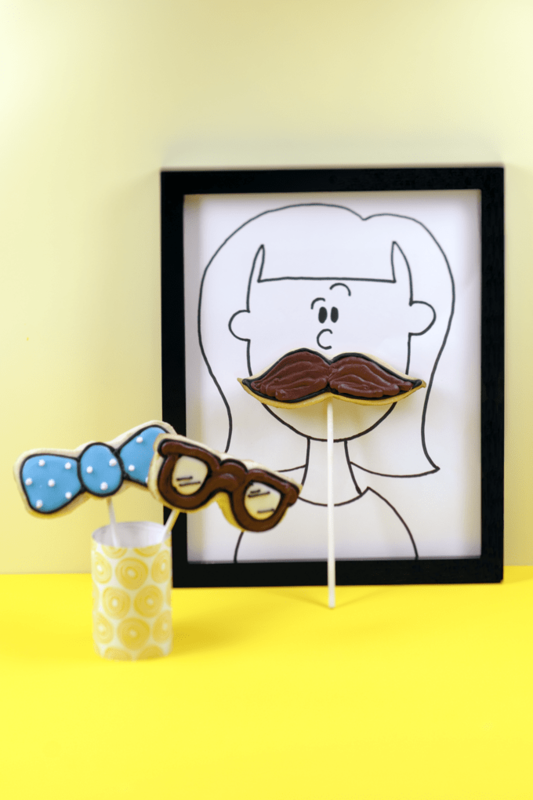 Outline your eyeglasses, mustaches and bowties with the black icing as shown. Let set about 15 minutes. 4. For the mustache, pipe the brown icing to fill the mustache, piping in the direction of the “hair” growth so the lines of icing look like hair. Let dry overnight before handling. 5. For the eyeglasses, pipe to fill the frames with brown icing. Flood white icing in the glass area. To flood, thin the reserved white icing with water, a few drops at a time, until the consistency of thick glue. 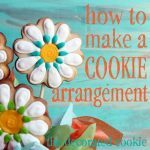 Fill an empty decorating bag with the thinned icing, snip ¼-inch from the tip, and loosely pipe back and forth to fill the cookie. 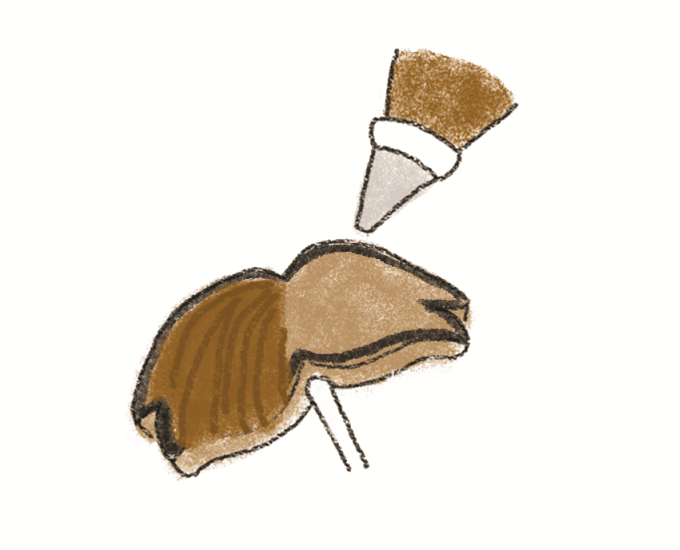 Use a toothpick to encourage the icing as needed until the entire space is filled. Let dry several hours; then pipe highlights on top of the white icing with the black icing after switching to a size 2 decorating tip. Let dry overnight before handling. 6. 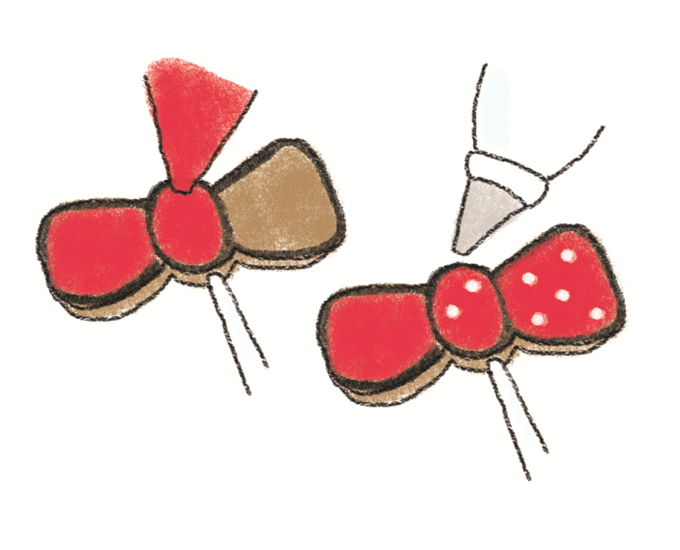 For the bow ties, use empty decorating bags to flood the blow tie with red or blue icing. Let the icing set several hours and pipe dots using the white icing in the decorating bag. Let dry overnight before handling. These really made me smile – I had to tweet them. My kids would love playing with these before eating them. What a fabulous idea! 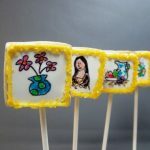 These are cute and fun and Jessie’s book looks like a must have in the kitchen library too. Oh my, sounds like too much fun!